Creation: VA 164 was requested by the Aug 1968 CTB to be an interstate corridor. This was turned down and VA 164 was first explicitly mentioned in the June 1971 CTB. VA 164 first appeared on the 1976 Official as a dotted line running from VA 135 to just across the Western Branch Elizabeth River.This is the 3rd VA 164. Adjustments: VA 164 first opened as the bridge over the Western Branch Elizabeth River in 1978. In 1984, the dotted line was extended west to US 17. About 1991, VA 164 was opened from the bridge west to Towne Point Rd. In 1992, VA 164 was opened out to US 17. A partial connection to US 58 opened in Sept 2004 after 3 years of construction. This extension was planned back in the late 70s although no map ever showed dotted lines as such. By Sept 2005 (Kozel site), the entire interchange was open at US 58. On Nov 30, 2016, VA 164 was extended along US 58 west to London Blvd (VA 141), then south as newly constructed freeway (Martin Luther King Jr Freeway) to I-264. Improvements: Full freeway on all segments as they opened. Posting: Fully posted; During the time where VA 164 ended short of US 58, there were no postings telling you how to get from one route to the other, which required turns in a residential area. In Feb 2015, D'Sean Lee reported that there was an I-164 shield on Cedar Ln NB. This was corrected by the time I got down there to take a photo. 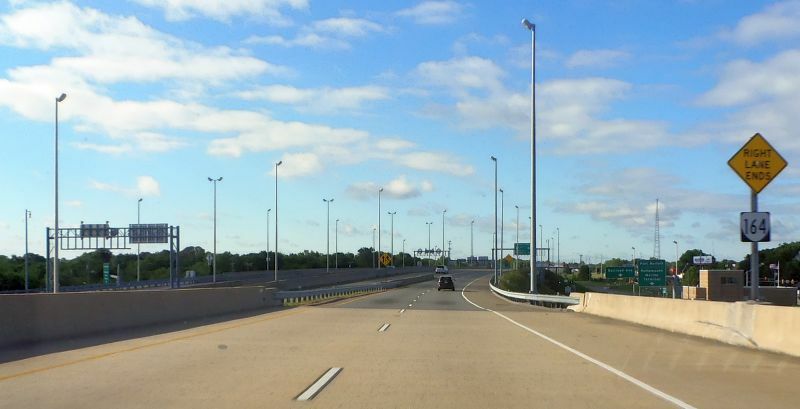 The Martin Luther King, Jr. freeway was supposed to be tolled but the State of Virginia bought out the toll in July 2015. Much, much more information on the planning and execution of VA 164 can be found at Scott Kozel's site. VA 164 #1: Appeared in July 1933 as a renumbering of VA 501. Ran from US 58 Virginia Beach Blvd along Laskin Rd, ending at US 60 (now just Atlantic Ave). 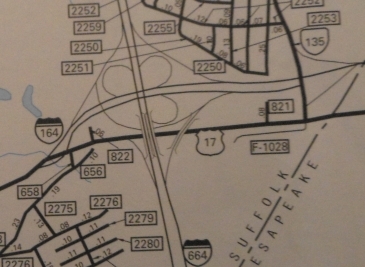 In Sept 1937 (CTB), a second piece of VA 164 was created, running from VA 165 Princess Anne CH east to Nimmo, ending just short of SR 615 (SR 629 is clearly shown in between on maps). In 1943 or 1944, this second piece of VA 164 was renumbered as VA 149. In 1955, Laskin Rd was upgraded to a "controlled access highway". The 1956 Official map then showed VA 164 renumbered as part of US 58. The 1 block between Pacific and Atlantic Avenues is no longer primary. VA 164 #2: When US 58 was moved to Laskin Rd in 1955, VA 164 was assigned to US 58's old route on Virginia Beach Blvd to Atlantic Ave. In May 1958 (CTB), VA 164 was renumbered as US 58 Business from Laskin Rd to Pacific Ave and US 60 Business on 17th St to Atlantic Ave, which remains so today.